a·mor·phous Av FEST is calling for proposals! The submission period ends on 31 May 2017.
a·mor·phous Av FEST will take place on 29, 30 June and 1 of July in Caldas da Rainha, Portugal. 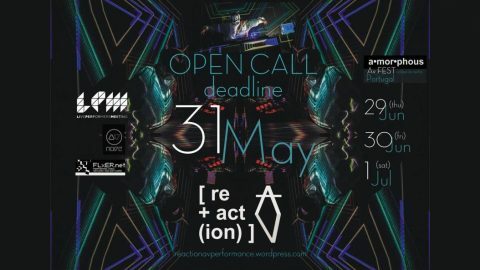 [re+act(ion)]AV it’s a collective platform born with the clear objective of creating in Portugal, with an international reflex, events dedicated to present Audiovisual Performances. Thus gathering live artists working audiovisual media in its different forms and representations that unite art and technology, experimentation, live video and music creation, performance, veejaying, deejaying, mapping, programing, the encounter between different forms of expression within the multimedia visual arts and the fusion with diverse artistic expressions. It also aims to work as a catapult for AV projects creating the conditions to introduce them to the public, as a space for provocation, reflection, inspiration, demonstration, sharing and exchanging experiences within the digital culture and contemporary performance.